There are electronic design circuit to build simple microphone amplifier using Condenser Microphone (CM) will give the sensitive sound. One of the simple microphone amplifier circuit is look like in Figure 1 below with the main component used are CM and transistors that popular today. In this time, beside we will show you the circuit, here we also will show you component part and global description about this circuit. Circuit like in Figure 1 above show you about the microphone amplifier using the main component Cm and transistors. 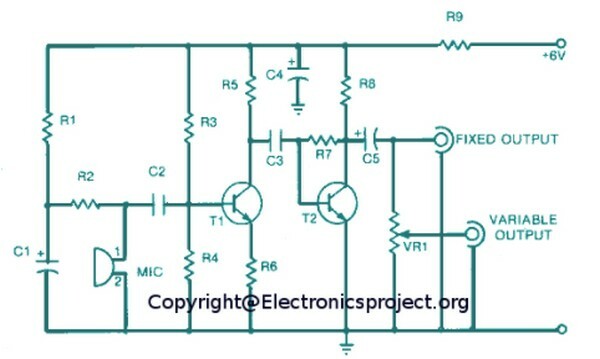 From Electronicsproject site describe that the circuit diagram you can see that microphone is employs as the transducer. The output of the condenser microphone is quite low it has to connect with an FET amplifier. This amplifier circuit is power by the R1,R2 resistor network. The output of condenser microphone is fed to a two-stage amplifier. Transistor T1 (BC149C) utilise current series feedback the first stage. The second stage comprising transistor T2 is connected in the voltage shunt feedback configuration. These two stages provide sufficient gain to pick up even the slightest whisper. The amplifier circuit in the site requires 4.2 volt supply which can be obtained with a resistor R9 [1k]. The value of this resistor may be altered to suit a supply voltage other than 6 volts. Output of the microphone amplifier can be made variable by connecting a 10k potentiometer as shown in the circuit. Circuit‘s gain can be increased by reducing the value of R6 to 47 ohms or 22 ohms. depending on the input sensitivity of the main amplifier system. Increase in gain was also observed by using 3V supply and eliminating R9 altogether. The microphone should be housed in a small round enclosure.